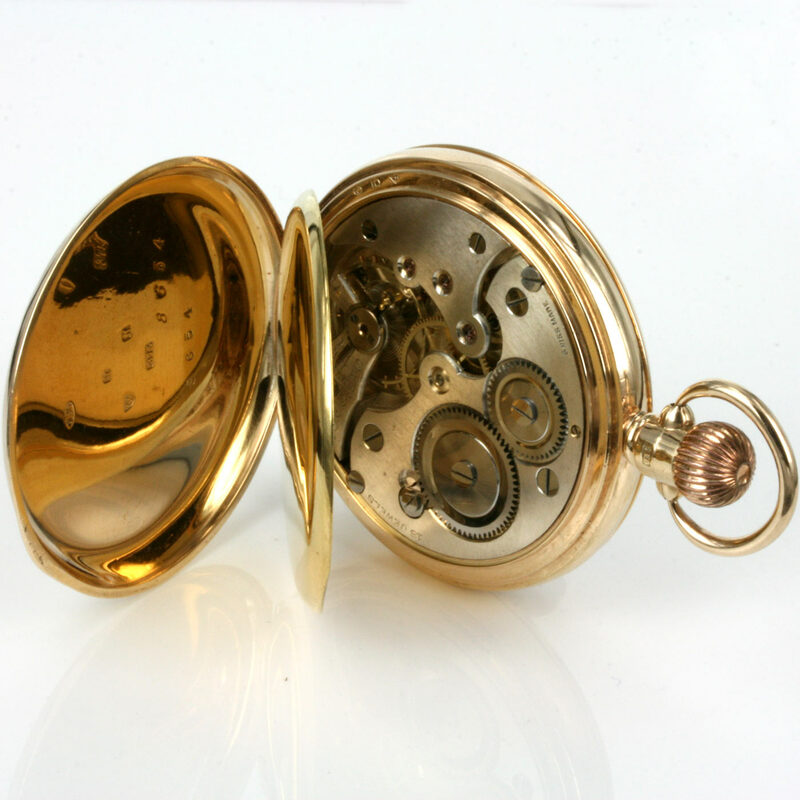 Product code: Q110 Categories: Sold Items, Sold Pocket watches. There is nothing quite like the feel and heft of a genuine antique or vintage pocket watch in the palm of your hand as it has the feel that only an antique pocket watch with a mechanical movement can have as opposed to a modern quartz powered reproduction. And this pocket watch is simply superb to feel in your hand and made in one of the most sought after case styles – the half hunter pocket watch case. 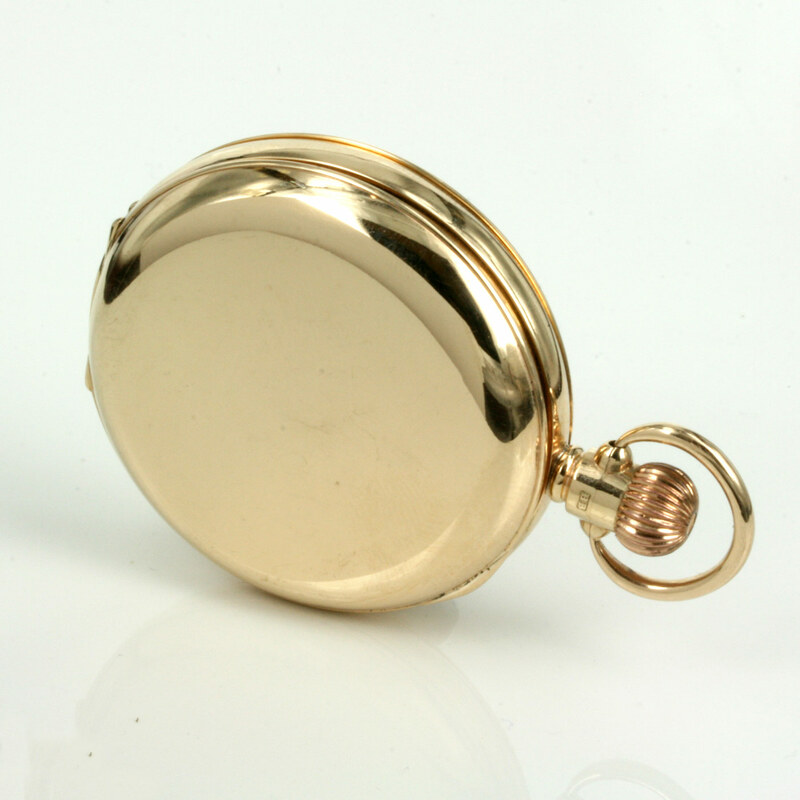 Made in solid 9ct gold in 1931, the pocket watch case is called a half hunter (or demi hunter) pocket watch as it has the protective lid, yet is still able to display the time while the front cover is closed thanks to the inner circle cut out in the centre. Made with black enamel markers on the outside, the hands as can be seen when the cover is opened has one traditional hand and a double spade hand for the other so you can differentiate between the hour and minute hands. Inside again Roman numerals have been used and it also displays the sub-seconds at the bottom. In the back is a 15 jewelled manual wind Swiss made movement that has been fully serviced and runs perfect and comes with our 1 year warranty. The solid gold case is in superb condition with the hinges all stopping at 90 degrees and not bending over, and no dents in the case. Measuring 50mm across by 13.6mm in width, this is a solid gents pocket watch that has a total weight of 84.7 grams and feels exactly as a gents pocket watch should do when you hold it. Antique half hunter pocket watches in this condition don’t turn up often, and this one is just perfect from the case style and condition, the traditional dial and the fully functioning mechanical movement.